Here is the long-awaited series of DVD playing guides for shakuhachi in English. Beginning and intermediate students of the shakuhachi will find this two DVD set extremely informative and beneficial for your practice. 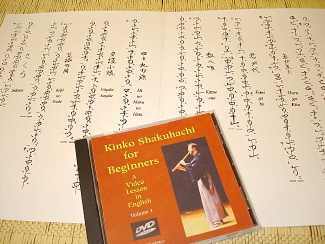 These instructional DVDs are an excellent way for the student of shakuhachi to have a similar experience as sitting down with a shakuhachi teacher and learning step by step. This set of DVD shakuhachi teachings is an enjoyable and effective way to acquire and practice the basics of the Kinko style honkyoku. This volume 1 DVD includes performance and notation examples with exercises and pointers on tone production, the traditional notation system and basic kinko ornamentation. Kinko Shakuhachi is distinguished by the use of ornamentation, particularly the atari breath-finger attack, and by the variety of tone colors, most notably the meri techniques and alternate fingerings, available to the player. After a brief introduction to various performance settings for Kinko shakuhachi, this video gradually introduces the notation system, techniques and fingerings. Particular attention is paid to the atari attack which is used on nearly every note in the performance examples. Huebner carefully demonstrates, discusses and takes the student through each melody with close-ups of actual performance and the traditional Kinko notation. 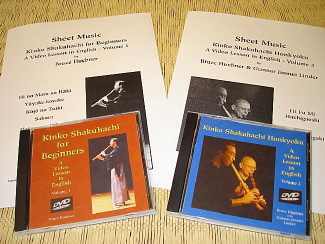 This volume 3 DVD includes performance and notation examples with pointers on the solo Kinko honkyoku classics Hifumi, Hachigaeshi and Akita Sugagaki. With guest Gunnar Jinmei Linder. 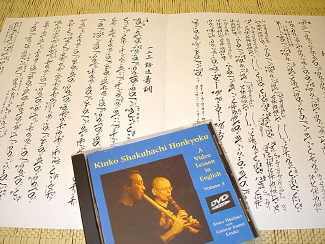 Using the classic standard honkyoku Hi Fu Mi Hachigaeshi, the first piece taught in the Kinko repertoire, this DVD lesson teaches how to read and interpret the Kinko notation system. With easy to follow demonstrations, notations, examples and graphs, this DVD explains the rules of the rhythmic system, ornamentation, symbols and phrasing. After Hi Fu Mi Hachigashi, representative phrases from Akita Sugagaki are covered. Bruce Huebner is the first non-Japanese to graduate from the Japanese Music Department of the Tokyo University of Fine Arts and Music, where he studied under the Living National Treasure, Yamaguchi Goro for nearly five years. Bruce also studied with Jensuke Kawase and earned his master teaching degree from Chikuyusha in 1995. He is currently Assistant Professor of Music at Fukushima College for Women in Japan. Gunnar Linder graduated from the Japanese Music Department of Tokyo University of Fine Arts and Music, as the second non-Japanese to go through the post-graduate course. He earned his Shihan master teaching degree, and received the professional name Jinmei, from his teacher Goro Yamaguchi, head of the Kinko-ryu Chikumeisha guild. He is active in Japan, and also frequently teaching and performing in Europe. Vol 1 and Vol 3. The Vol 2 DVD is not included because it deals with playing shakuhachi in an ensemble format with koto and shamisen. This volume is not as popular as the two being offered here.